This blog links to a presentation I am giving in London on the 19/10/18 on the subject of learning in stretched environments, or at least that’s the official title. My original title was ‘teaching in a riot’ as the ED is often chaotic, unpredictable, busy, sprawling, uncertain and occasionally dangerous and somedays it does feel tough. However, riots are defined by advsersaries coming together and we don’t want to give the impression that we are fighting anyone, so after a bit of tweaking a more PC title was agreed. The reason I’ve been asked to speak is because I work in a busy inner city emergency department where the pressures of service delivery are high, there is a constant turnover of junior staff and where there is little or no down-time or even periods of low activity. Life in Virchester is 24/7, 365 and any notion of us all stopping for a few hours in order to ‘Do Learning’ is fanciful. What we need are ideas and solutions about how we get education to blend into the workplace and not consider it as a separate entity. 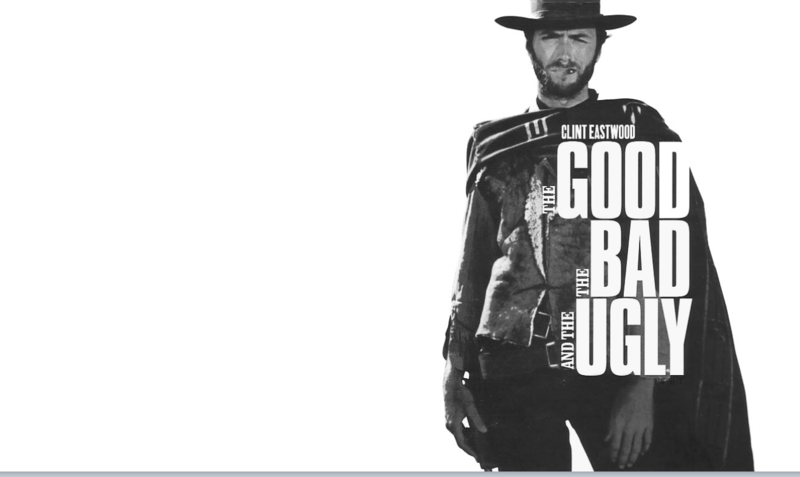 Close your eyes and think about your answers to the following questions based on the Clint Eastwood film the Good, the Bad and the Ugly. The Good: Think of a time when you had a really great educational experience where you were treated really well, when you felt valued and when there was no stress and where you learned something profound. The Bad: Think of a time when you were treated badly, where you might have been humiliated or felt awful. Did you still learn something? The Ugly: Think of a time when something went wrong. It could be a patient outcome, it could be an interaction or some other mistake. Did you learn? I’ve done this exercise with hundreds of people over the years and it pretty much always gets the same reponse. People can think of positive experiences of learning, often in formalised, well prepared and chronologically protected teaching experiences, but these are by no means the only way that we learn. When I have done this exercise in the past it is often those experiences which are really challenging, the bad and the ugly, that profoundly affect learners and change behaviours. There are many physiological and psychological reasons why this is but we don’t have time to go into that at the moment. The point is that a huge amount of teaching and learning takes place in the work environment in what may appear to be random, unstructured and unprepared ways. We need to ask ourselves whether that is acceptable or perhaps whether we can do better? Is it all about workload? We know that emergency medicine is a busy place. Service pressures are unending, in the UK we have impossible to achieve 4-hour targets to meet, and demand appears to be rising year on year. There is thus a natural tendency to believe that service pressures and workload are a major reason why we might struggle to teach in EM and other acute specialities. I want to challenge that and ask you to reconsider. For many years I have not believed that workload alone is a factor in the educational value and overall satisfaction of trainees. I based this on my experience as a Director of Medical Education in one of the largest UK hospitals and in my role as an Education Associate with the GMC. In both those jobs I have met and discussed education with thousands of UK trainees in a whole range of different speciailities, career paths and grades. What was obvious to me was that we found many trainees in ‘quiet’ posts who were as miserable as they could possibly be, and we also found trainees in the most bonkers busy posts you could imagine (like my own department) who were very happy indeed. The feeling was that workload does not equal satisfaction, but surely there must be a link…… or is there? In the UK all trainees are asked to complete the annual GMC survey. The results are available online 2and you can view them yourself here. The survey asks many questions, including those on overall satisfaction of a training post. This is an overall score about how trainees view the training opportunities in a post. It’s a global measure of how well they view the experience and opportunities. The survey also covers a whole range of other elements of the teaching and learning environment such as supervision, study leave, resources, teamwork, handover etc. So it’s pretty comprehensive at looking across the range of experiences our trainees have. 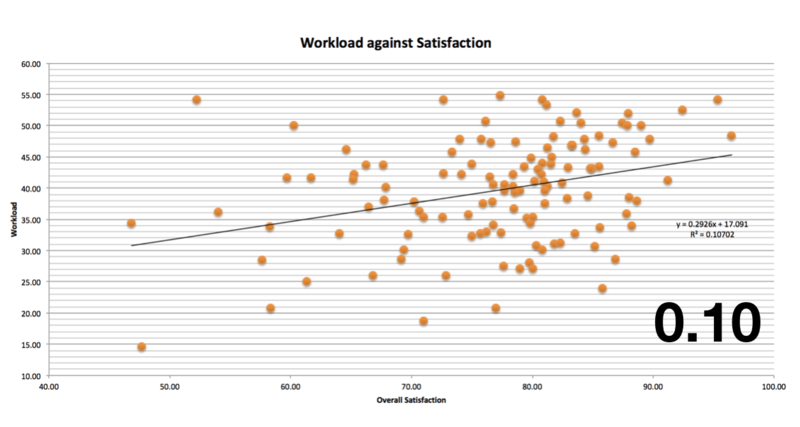 If workload is a major factor in the educational experience of trainees then we could look to see if there is a correlation between overall satisfaction and workload intensity. I’ve done this for EM trainees across the country and the results are really interesting. 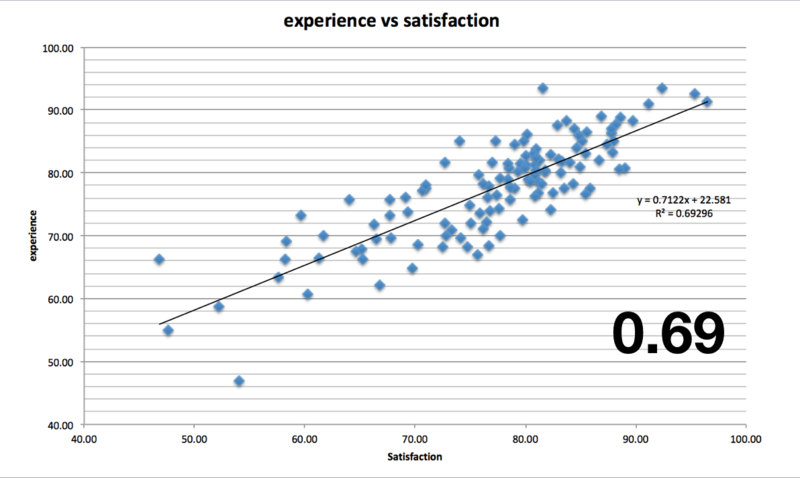 Let’s start with something that does correlate with overall satisfaction: experience. Of all the factors in the survey ‘experience’ has the highest correlation with overall satisfaction. I interpret this as trainees really wanting to learn, they want to see patients, learn new procedures and get better. I was really delighted to see this. What about workload though? Does that link to overall satisfaction? The answer is below and the answer is clearly not. I’m not going to present all the data here, but the fact is that there is only one element of the GMC survey that has a lower correlation with overall satisfaction and that is ‘regional teaching’ which clearly has nothing to do with the local environment. What can we take away from this small piece of work? I’m sure you can sit there and pick holes in the methodology and the analysis and I agree that it’s not perfect, but it is a survey with a response rate of over 95% amongst all UK trainees and it’s their reported experience so I don’t think we can dismiss it. A couple of things are worth taking away from this. Firstly, the paper is submitted, so don’t nick the idea 😉 . Secondly it supports the view that workload is not a major factor in educational experience, and it must therefore be possible to get a great educational experience in a busy environment. Our job is to think about why and how. The original title (teaching in a riot) was based on the experience of teaching and learning in the ED environment. Some days it does indeed feel like a riot, unpredictable, scary, dangerous, uncertain, unplanned and somewhat random. Our clinicians are busy and focused on patient care and so the challenge is in how to squeeze education into clinical practice in a way that engages the wider team and not to simply consider the working shift as service delivery. We must abandon any belief that teaching takes place in ‘teaching sessions’ that are separate from the workplace, rather we need to embrace teaching and learning in the clinical environment, working with and not against the service delivery that our patients and health economies require. In the RSM presentation I focused on 4 strategies that can be implimented everywhere, by everyone, with minimal cost and as soon as tomorrow. Some of these you may have heard of before and that’s fine. Some may be new and I’ve provided the links to these. If you want more ideas then I would get in touch with our friend Scott Carrington who is an expert in this area and who has links and aide memoires on a whole range of strategies and techniques for teaching in a busy (and occasionally not so busy) ED or acute care setting. You can find out more on the EMEC website3. You may be familiar with the phrase ‘every day is a school day’ which implies that we can learn something on every shift that we do. Perhaps that is true, but do we recognise it, share it and reinforce it? It’s not uncommon for trainees to complain that they don’t get teaching in placements because they often imagine that teaching only takes place in specific teaching sessions. As described earlier this is clearly not the case, but we might need to do better in embedding and idetnifying work placed teaching in our trainees. One solution is white-board or post-it-note teaching strategies. These are described in detail on the AliEM site but basically involve each teaching interaction being recorded on a teaching white board if you have one, or on a post it note if you don’t. These can then be collated, photographed and shared amongst the shift and the wider EM community. This has the advantage of identifying that teaching has taken place, as this may not always be obvious, but can also act as a form of spaced repetition and record keeping as the learning points are returned to through the shift and perhaps later. I’m sure you’re an amazing shop floor teacher and you really work hard to spend time teaching a clinical point when you discuss patients. I’m also pretty sure that you think that the trainee remembers everything that you said. The thing is they don’t. When we have a clinical conversation there are often points to learn and as we discussed above we can put these down as post it pearls, but that’s not always adequate when we want to explore something in more detail or when we want to back up the teaching ideas and rationale with evidence from other sources. This is where the teaching or #FOAMed prescription comes in. We’ve discussed this on the blog before and you can read more here, but in essence we follow up a clinical conversation with a link to an online resource, usually one that we already know about. As smartphones are ubiquitous these days we can do this really quickly as demonstrated below. The advantage of this is that the follow up to the learning is then delivered to the trainee in a format that they engage with all the time. Let’s face it, our trainees (and our trainers) are wedded to their smartphones and so the idea of delivering background information to them at a later time (spaced repeititon) and with depth links into how the learning generation interact and behave. We call these #FOAMed prescrptions as we try and link to free open access resources, but in truth you can link to anything available on the internet. I’ve timed this on an iPhone Xs and it takes less than a minute to go from turning the phone on, to receiving the email and following the link to the web based resource. This may be controversial but there is a place for shared learning using social platforms such as discussion groups and forums. Some of these will use platforms which are more commonly associated with social interactions such as whatsapp and facebook groups. We may be cautious about this, with good reason, but let’s stop and think about whether this is something we might pursue. In my EDs we see something in the region of 500 patients per day and within that number there are always, always, ALWAYS, interesting cases and patients. Every day we have the opportunity to learn from cases that have elements relevant to a wide range of clinicians in the department. The problem is that not every clinician will get the opportunity to be involved in that case. It might be that they are busy doing something else or it might be that they are on a different shift that day. Whatever the reason the result is a differential learning experience between those who get involved in a case and those who do not. As a result learning is not easily shared between colleagues and in the absence of any regular or well attended face to face meeting amongst clinicians we need to think about how we can do this more widely, but most importantly safely. In Virchester the solution has been to use anonymised, and in many cases imaginary, patient stories on a secure platform. Cases are posted in a way that entices other members of the team to proffer opinions on diagnostics, treatment, management or on wider issues about the topic. For example I might see a patient with a dislocated ankle needing reduction in the ED that led to a really interesting discussion with a trainee on sedation techniques. I would then post an imaginary history of a made up patient together with an X-ray sourced from an online library (e.g. Radiopaedia as shown above) to drive a discussion about patient management and in particular sedation choices. Other participants in the forums can then respond with their views, opinions, links to evidence etc. and then the conversation can develop as a shared learning narrative. Whilst this is driven from individual patient cases, with careful use of anonymisation, creation and similar online resources we can share learning across the entire clinician group within the ED. For the sake of brevity let’s take it as read that from a learning perspective debriefing is a good thing to do after significant events. In the ED there are many significant events, major trauma, cardiac arrest, severe sepsis etc. where teams come together to treat patients. In most if not all cases there is a strong argument for a short debrief to reflect as a team on what happened and to record and share that learning. The problem is that in most cases this does not happen. Time, the next patient waiting and the lack of a structure all intefere with our ability to come together and learn. We recently discussed the use of Hot Debrief Protocols (HDBs) on a blog post about improving resuscitation skills and it’s worth reiterating this now. 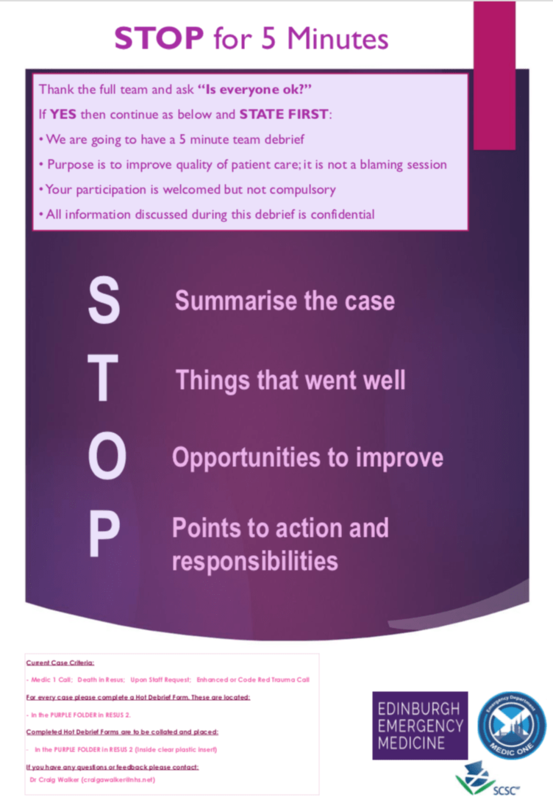 In Virchester we are implimenting the STOP5 process developed in Edinburgh, but in truth it does not have to be a specific system, what is important is that you have a system that improve the quality and frequency of debriefs in time pressured environments. STOP5 has been developed by Craig Walker and colleagues and gives a structure to a debrief that can be delivered after most if not all significant resus events. Here are some top tips from Craig based on his experience of using it in Edinburgh. Teaching in the ED, or in any other complex, high acuity, high activity environment requires trainees and trainers to be adaptable and reactive to the events around them. At first glance it might seem that the best teachers are those who are spontaneous and purely reactive to the randomness of events within the ED. In truth the opposite is probably true. True spontaneity in EM education takes a lot of preparation and practice. I hope the ideas and thoughts here are useful. Remember that all of them can be started by everyone, at any time and with minimal cost. Why not make just one change in your practice by giving one of these ideas a try and let us know how you get on. Learning environment: Effective learning and working in the NHS. RSM. https://www.rsm.ac.uk/events/dnm01. Published 2018. Accessed October 18, 2018. National training surveys. GMC. https://www.gmc-uk.org/education/how-we-quality-assure/national-training-surveys. Published 2018. Accessed October 18, 2018. Home page. The EMEC. http://www.the-emec.com/. Published 2018. Accessed October 19, 2018. There is a nice poster available here suggesting 30 second, 2 minute and 5 minute teaching strategies for use in clinical encounters on ward rounds. Easy enough to apply in the ED too. As you say, it is up to us to actively embrace on the job training (probably the most successful and pervasive model for many jobs throughout history) and be ready to make, not just take, opportunities to educate each other.